Have you always believed the adage that “nice guys finish last”? If so, you might enjoy reading this book and it may even change your mind. Linda Kaplan Thaler and Robin Koval are CEO and President, respectively, of the the Kaplan Thaler Group in NYC. In 2006, these advertising execs published a book entitled, The Power Of Nice: How to Conquer the Business World with Kindness. As a person who is often told I am “too nice”, I took notice of this book when I saw the authors discussing the book in a YouTube video. When I found the book at my local library, I decided to read it for myself. One of the first things I realized when I started Barry-Jansson & Associates in 1994 is that business is personal and true success doesn’t happen in a vacuum. Businesses grow because of people (inside through employees and outside through customers). Therefore, operating with kindness and respect, and following the golden rule is more important to your business success than you may realize. In an age where competition seems cutthroat and egos want to be in control, it may be tempting to get in line with this behavior, but it won’t help your business. Across 10 chapters in this small book, the authors share real-life examples where being nice or choosing kindness over other options made a big difference. It reminds us that the nice stories are rarely on the nightly news and often not shared in the work environment. With so many positive stories, the book is very uplifting, and many chapters end with suggested exercises to practice ways of being nicer. For example, getting out of the habit of gossiping, looking for things you can appreciate about even the most difficult people, finding the courage to be honest. 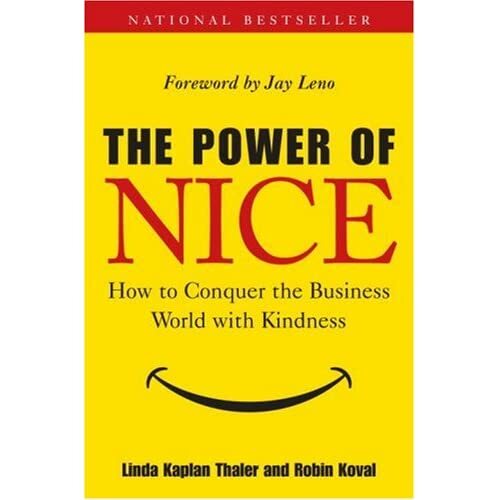 I have enjoyed reading this book and am even more convinced that being nice is very good for business.